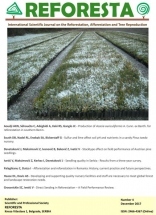 Reforesta is an Open Access, peer-reviewed online journal published by the Scientific and Professional Society Reforesta. Reforesta publishes original papers on the fundamental and applied aspects of tree improvement, plant production and quality, and afforestation/reforestation. Reforesta will consider only original manuscripts that have not been published elsewhere and are not under consideration by another journal. No articles processing charge is applied.